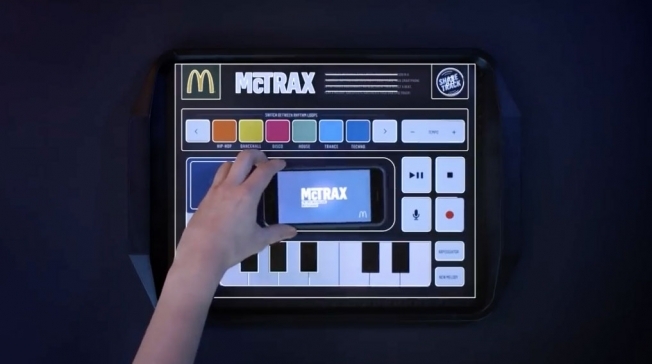 McDonald’s just launched an in store activation that transforms your average place mat into a your own recording studio. The fast food chain used conductive ink, a small battery and a thin circuit board with 26 digital touch points to radically digitize the average place mat . Customers can put their phone on it, download an app and make music with in-house produced audio loops, synths and musical effects. You can also record your own voice. 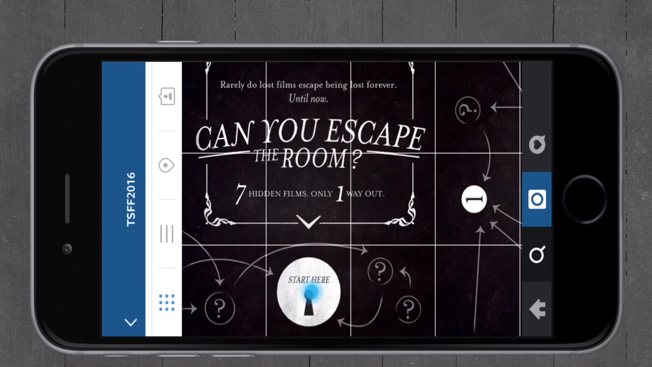 The Toronto Silent Film Festival created the first ever Instagram escape room, utilizing a panoramic single image of a room, cut into a series of videos. When you click on one these videos, you get a first-person view of yourself searching that particular part of the room. Sometimes you’ll find a clue; other times, you’ll chance upon one of the once-lost films, which will give you a letter. Gather all the letters up for a code that will lead to your escape. Cool for people who like puzzles! 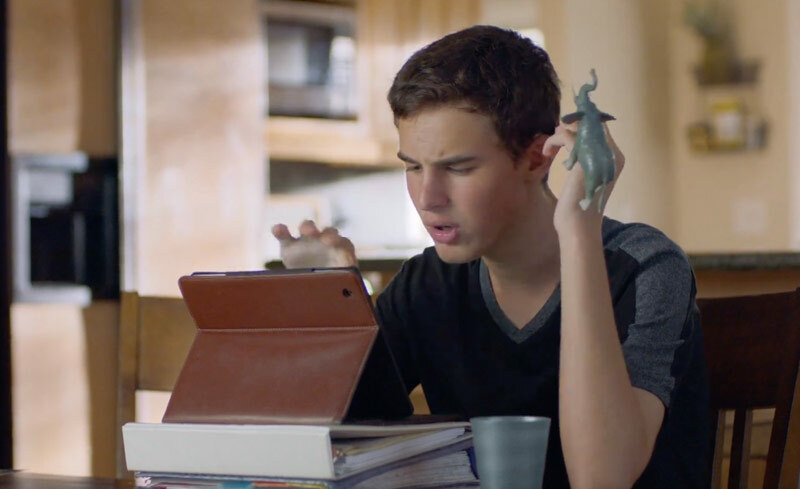 In observance of World Autism Day, Apple released a new campaign that chronicles the life of a teenage boy with autism who learned how to speak with his IPad. 16-year-old Dillan Barmache, couldn’t speak because of his form of autism, but with the help of his speech therapist and an IPad, he was able to write down his thoughts and feelings and have them voiced through the device. This approach was so effective that, two years ago, he was able to deliver a graduation speech. 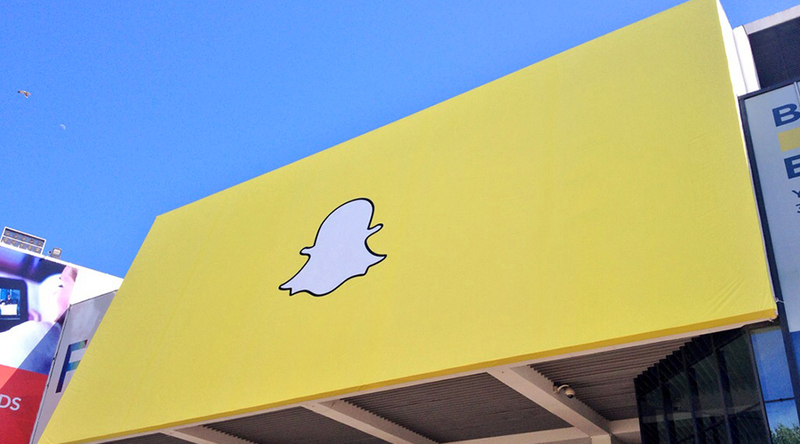 Snapchat has been running 50 static billboard ads that bring their artistic geofilters to several cities. Each billboards represents a geofilter for the specific area. 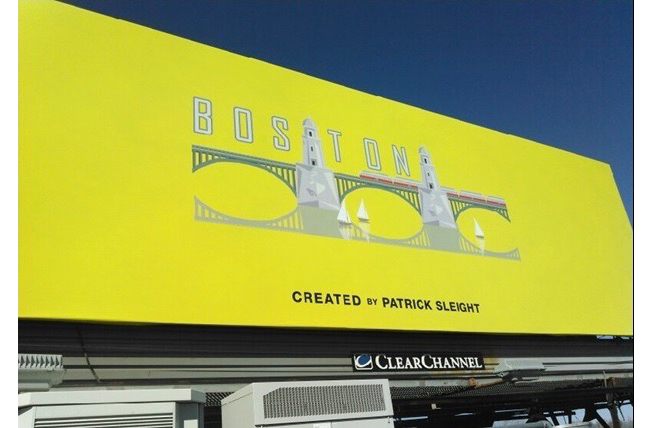 The billboards don’t contain the Snapchat logo, making them a nice inside joke for users. The creative for each geofilter is user generated by the Snapchat community. 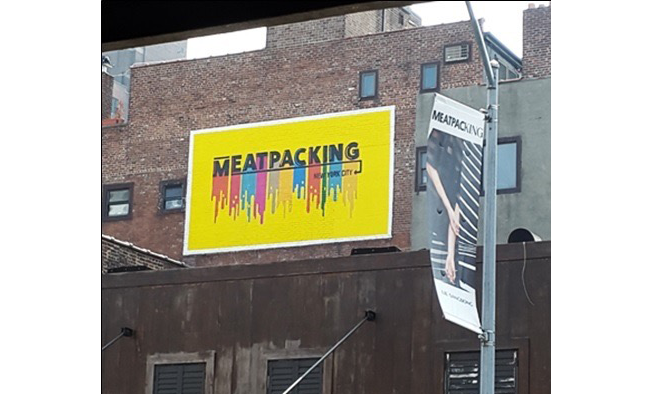 The locations include: New York’s Meatpacking District and SoHo neighborhood, the Mission District and Fisherman’s Wharf in San Francisco, Palm Springs, Calif., Chicago proper and its Lincoln Park neighborhood, Phoenix, Detroit, Boston, Miami, Portland, Toronto, Montreal and Arlington, Texas. Later this month, Canada and the U.K will be receiving the same billboards. Splash, a new app launched at South by Southwest , is working to create a Snapchat-like platform for experience sharing in virtual reality. 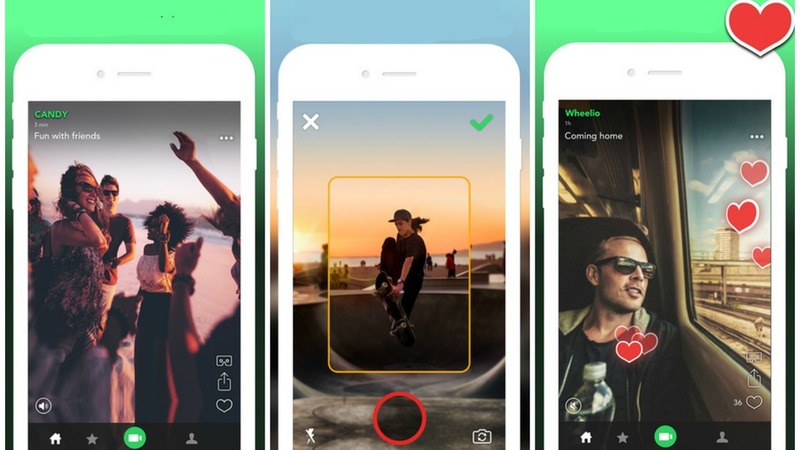 Splash is the hypothetical love child of Periscope and Snapchat but all the content on the platform are 360-degree images and videos. The app allows you to share these videos of your surroundings that can be viewed on both smartphones and VR headsets. It takes the experience of snap chat even further and connects you with not only your friends but the environment they are in. What sets it apart from other apps that allow you to capture 360-degree views, though, is that you can also record video in addition to a static image. While shooting a scene — a process that will be familiar to those who have shot panoramas on their smartphones — you can opt to record a video clip in parts of the frame. The results can vary from impressively immersive to wildly abstract depending on how you shoot (you can overlay multiple clips shot at different times on top of one another, for instance.) But Splash cofounder Michael Ronen says that flexibility — allowing people to create an “emotional landscape” — is the whole point. 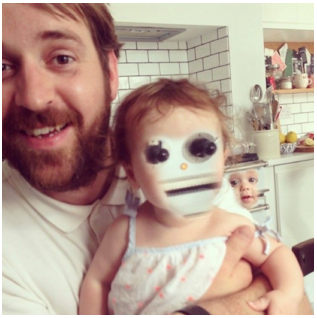 Face swapping is the new craze that is taking the world by storm. Why wouldn’t you want to swap faces with your BFF? Platforms like snap chat have found a way to blend facial recognition technology into their experience and now Facebook is ready to jump on the bandwagon. 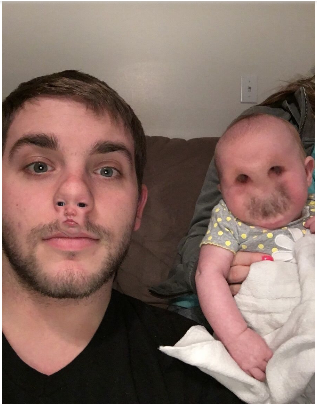 Facebook just acquired MSQRD, an app that not only allows you to seamlessly swap faces with your friends, but also provides multiple fun real time filters for users to play with. 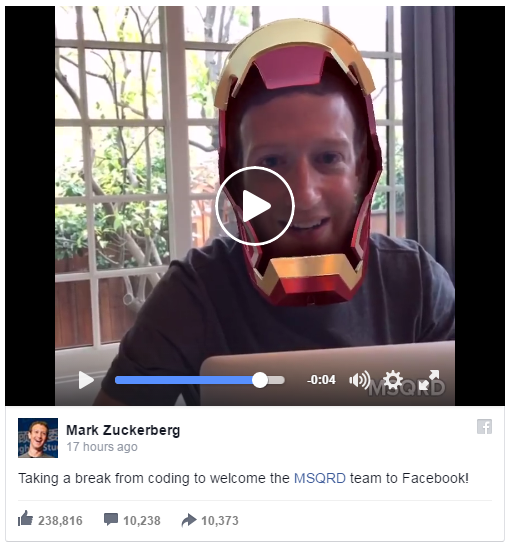 Today Facebook founder Mark Zuckerberg uploaded a video utilizing MSQRD’s iron man filter, announcing the partnership between the to companies. This is a good move for Facebook because they always keep their ear to the ground to see what is trending and finding ways to incorporate that into their experience. 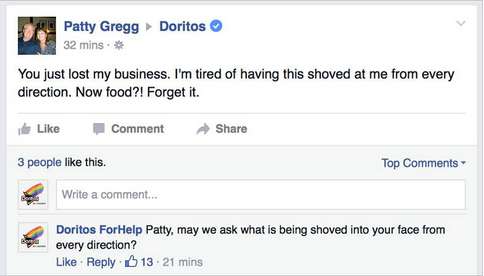 Choosing MSQRD was also a good choice on Facebook’s side because the user experience is way better than snap chats. On Snap chat you have to hold your finger down on your face for your face to get scanned before you have your fun, while on MSQRD you literally just point the camera to your face. 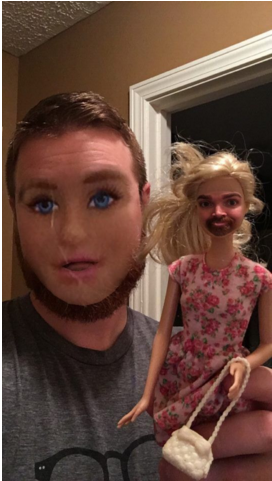 To celebrate the partnership, here is a few crazy face swaps that will either make you cringe or laugh. 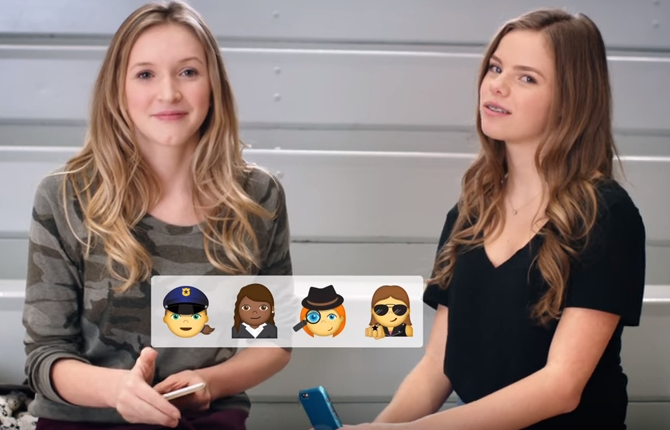 Always launched a new video in their #LikeAGirl campaign, this time taking on gender discrimination in the most unlikely place, your emoji keyboard. Executives at Always, contacted the Unicode Consortium about expanding the available emojis to more accurately tell stories about how girls live today. The president of Unicode, Mark Davis, wouldn’t commit to making specific changes, but said that, “the Consortium has been working on full representation of gender in emoji. We appreciate the efforts that Always is taking to collect feedback and input into the process for new emoji characters.”This follows Unicode’s focus on “broadening cultural representation in emoji to include diversity of skin tone, family groupings and geographic locales,” he said. Yesterday Instagram announced that they will start counting views on videos, which will clue marketers into how many users watch their ads. Instagram video and photo engagement is generally measured in the form of likes and comments. In a blog post, the Facebook-owned app called views “the most widely expected form of feedback” for videos, and added that users will see view counts roll out over the next few weeks in the app. They’ll be visible on videos posted in the app and on ads. 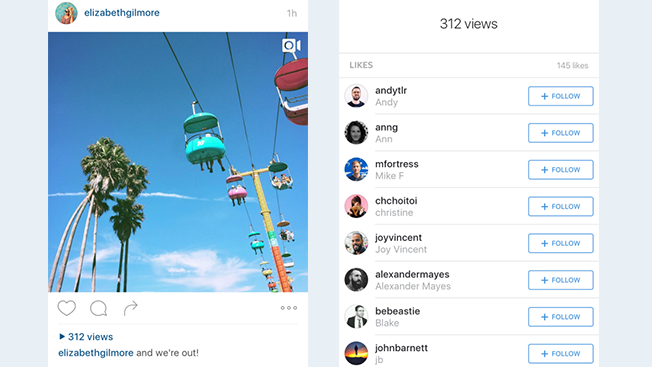 Instagram will mark a view as three seconds, just like Facebook. Instagram is definitely taking giant steps in a new direction with their video initiative. I feel like adding this metric can lead to better insights into video consumption on the app. However, the scroll through nature of Instagram will produce less than impressive numbers. Bose Turns Your Tweets into Musical Wonder! Bose wants social-media users to unleash their inner musician. The music-electronics brand is turning fan tweets into lyrics for its FanTracks initiative and driving it home for the Superbowl. 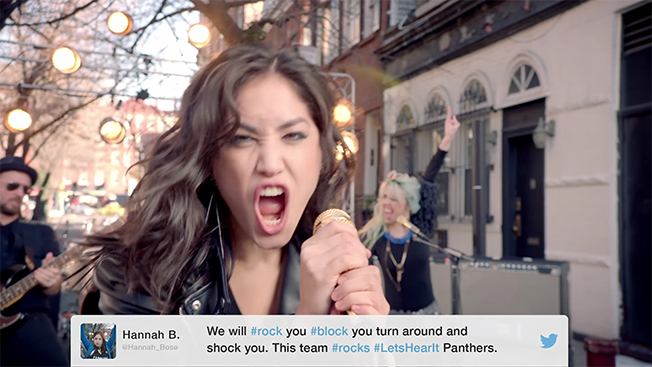 The whole week before the big game, A Framingham, Mass.-based audio company is encouraging consumers to compose tweets with the hashtag #LetsHearIt. Their words and emojis will be set to a variety of musical styles, such as country, gospel, funk and metal. The Tweet inspired tracks will be recorded by musicians at one of Bose’s studios and posted via social channels. The campaign will include a paid push, though it’s unknown how extensive the ads will be. I really like the incentive for this campaign, adding a tangible reward to something simple like tweeting is what social is all about. Axe’s new “Find Your Magic” campaign sheds its old male skewed stereotypical voice and redefines what it means to be a man. The new spot smashes the old idea of what a man is and paints a modern image of masculinity and embracing one’s individual sense of how to be a man. This new messaging is a huge turn around from Axe’s old voice that toted their product as a chick magnet. The 60-second launch spot even included such non-Axe-like visions as a man in high heels, and another in a wheelchair. Axe has received a huge positive reaction to the “Find Your Magic” campaign so much so that it will be bringing a 30-second version of the anthem TV commercial to the Super Bowl. In the two weeks since launch, “Find Your Magic” has garnered over 2 million views on YouTube. The leap to the Super Bowl will extend the message to 100 million-plus people. 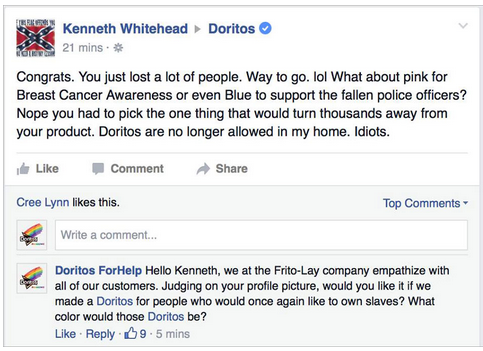 I think that this case study is a great example of a brand evolving as consumers and the environment change. With many lifestyles getting more recognition, its only right for the advertising to mirror the changes and be all inclusive. Prepd Pack will have all of your coworkers turning their heads, and you, turning a new leaf with its amazing combination of beautiful design and deluxe app. Prepd is a combination bento box/meal planner/recipe and nutrition database that not only looks cutting edge but has a cool app that helps you customize your lunches to fit with your health goals. The modular containers come in different shapes and sizes to accommodate anything from sandwiches to sushi rolls. They are made from a BPA-free plastic material called Tritan, and are dishwasher- and microwave-safe, plus leak proof. It comes with magnetic utensils and a silicone place mat built into the box, but the selling point really is the app. The Prepd app is curated by chefs, food lovers and nutritionists and organizes food by diet type, key ingredient and health goals. Standalone recipes and meal plans span the course of the entire week. 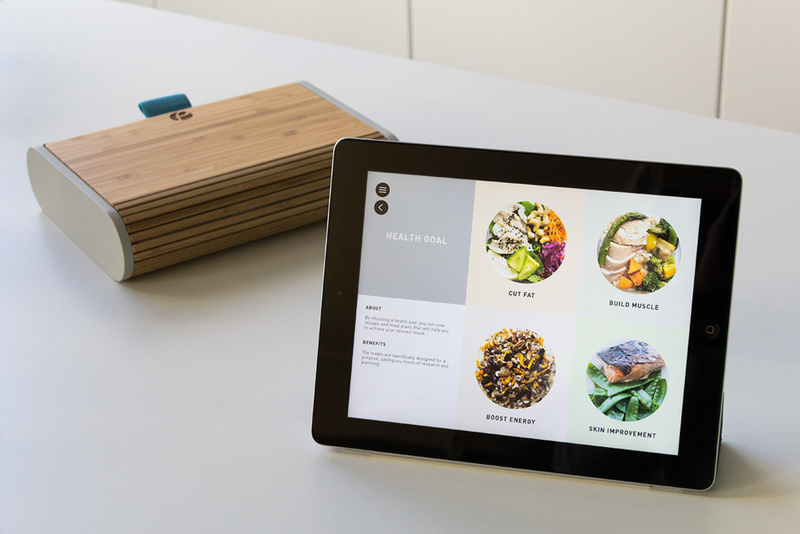 The app measures the nutritional content of what you eat and produces a customized shopping list, including portions necessary for each dish. Users can create a profile that can bookmark and store recipes that they want to to try but also upload their own recipes, enabling them to share with the community. This social aspect to dieting tends to make the process easier and also plays to consumers who love share online. Place the company responsible for Prepd, was looking to raise $25,000 on Kickstarter, currently the brand has crushed their goal and raised 153,995 with 35 days to go. The lunch boxes start at $50 each on Kickstarter, which includes the cutlery and one set of modular containers. Gotta catch em all…. Again! Pokemon one of the Titans of gaming, will air its first Super Bowl commercial as a larger initiative in their new #Pokemon20 campaign. 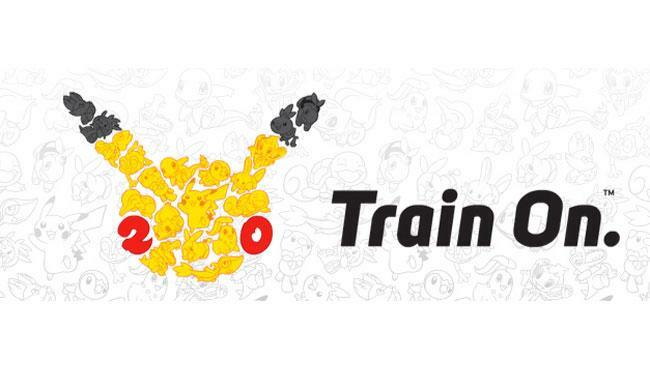 The Pokémon Company said that that the spot will encourage fans to “Train On.” This refers the competitive game play aspect of the Pokémon series, in which players are considered “trainers,” preparing Pokémon creatures for battle. Pokémon also revealed more details of their #Pokemon20 campaign, which has a social component, where fans will be encouraged to share their favorite Pokémon memories on Twitter, Instagram and YouTube. On Feb. 27, which is Pokémon Day, fans can attend special anniversary events at retailers. Where limited edition models of the new Nintendo 3DS will be available. 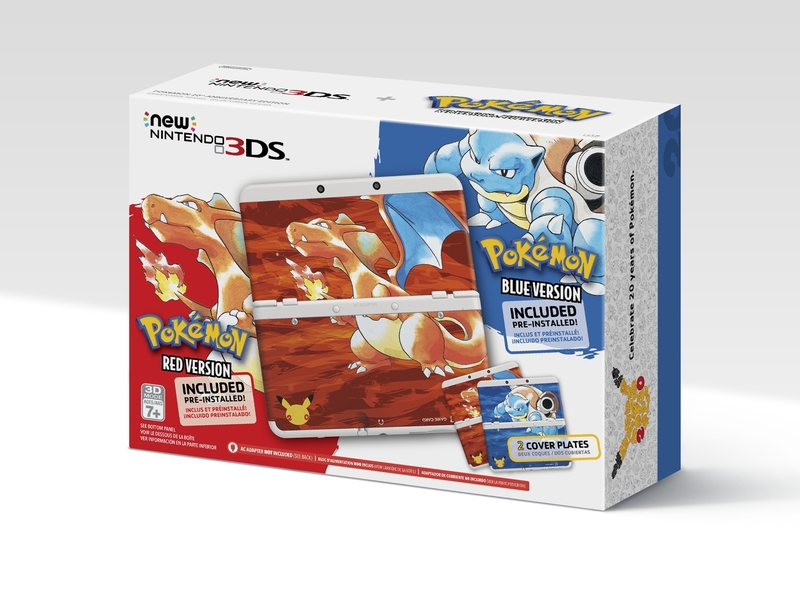 This device will come with face plates to commemorate the first Pokemon games to be released in the U.S, Pokemon Red and Blue. The same day, Nintendo will also make some of its best-selling Pokémon amiibo interactive figures available again—in particular, Charizard, Jigglypuff, Greninja, and Lucario. This week Twitter announced that they are rolling out a new product called conversational ads, this format will allow consumers to engage with and spread brand campaign messages with ease. Conversational ads will run similarly in build to promoted tweets but will have a call to action button with customizable hashtags that encourage consumer engagement. When the call to action button is tapped, the Tweet composer opens with a pre-populated brand message accompanied by the creative and hashtag buttons. The consumer can then personalize the Tweet and share it with his or her followers. As a thank you, the consumer then receives a message from the brand for having engaged with the Tweet. This is hardly a new feature a but a new take on how social media used to work, Facebook used to be a huge hub for business that capitalized on earned media. It seems Twitter is trying to replicate that old magic and bring forth revenue to their stagnant platform. A quick way to gain earned media. Canon Helps You Perfect Your Next Instagram Pic! 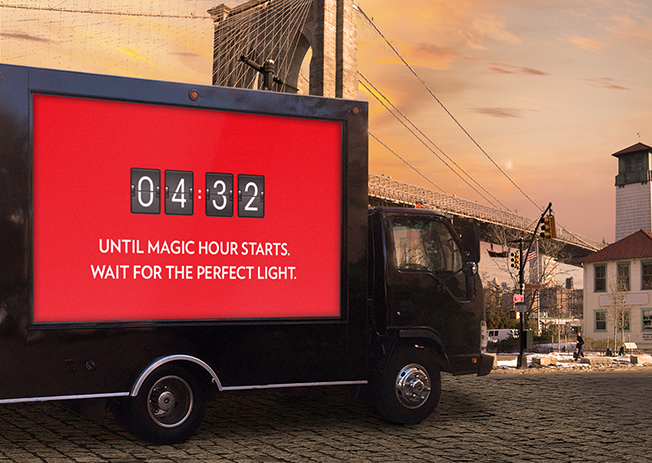 Last Monday Canon set up pop-up digital billboards around the most photographed places in New York City, to help people get the perfect shot. 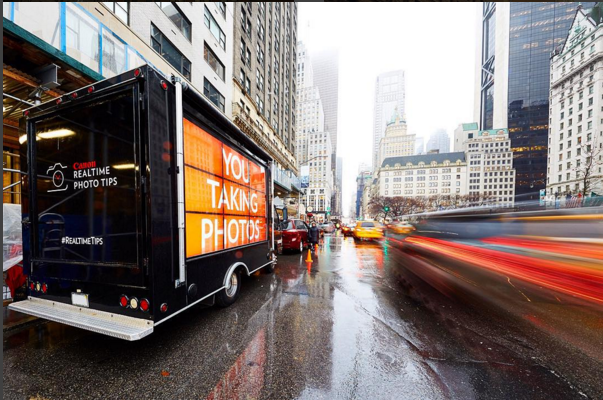 The outdoor campaign features trucks that pop open to display digital screens in three of the city’s most-photographed areas: the Flatiron District, Central Park South and the Brooklyn Bridge . Canon is also running the ads on billboards at Penn Plaza near Madison Square Garden. The digital billboards pull in 200 tips from data gathered from social networks, traffic updates and weather information. 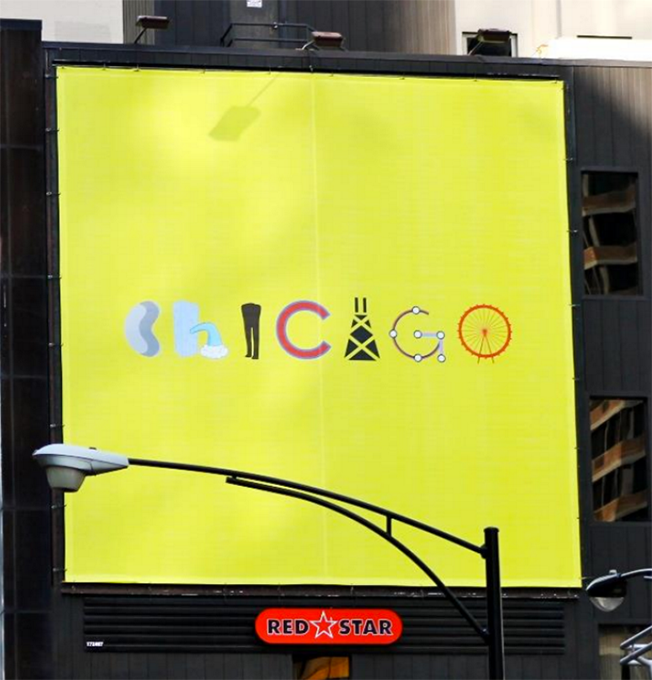 This data determines the billboard’s creative which can swapped to relate to current conditions. This real time functionality will evolve through out the campaign based on the different conversations taking place on Facebook, Twitter, and Instagram. Some examples of this real time functionality is that people going to to see a Knicks/Rangers’ game will see sport related messaging, but this Thursday during the Billy Joel concert, people will be receive messaging on how to take the perfect concert pic. A team of five people will also be on-site to give people tips on how to take pictures, and people can also test out Canon cameras. We are now living in a world where we photograph and share everything, from our dogs to our vacations. Image giant Flickr is now taking these photos to the next level with a new app that’s can transfer you into the picture. 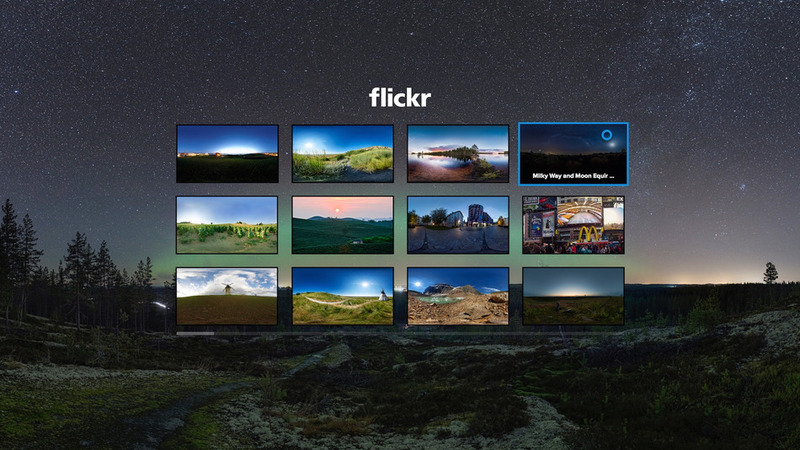 Flickr’s new virtual reality app, Flickr VR, is an app that works with Samsung Galaxy smartphones and the Oculus-powered Samsung Gear VR headset, allowing you to view Flickr photos in an immersive 360-degree. If you don’t have a Gear VR or Samsung Galaxy smartphone, you can still view 360-degree photos on the web, too. Supported photos will start rotating when you visit them. You can use your mouse to click and drag around the photo. Online dating sites seem to be a growing trend as sites like Tinder and e harmony are spreading like wildfire. The wide variety of singles on these sites can have a users kissing a lot of frogs. Now developers are building niche dating sites that cater to “specific” groups. one that is growing in popularity is “Mouse Mingle” which helps Disney fans find their prince/princess charming. 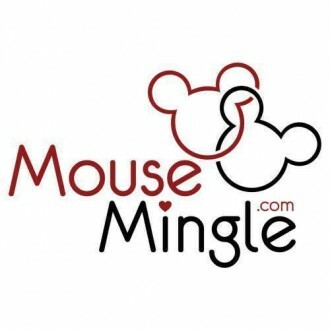 Mouse Mingle is a website where Disney lovers can connect and try to find their fairy tale ending.The website has all the elements of your average dating site, like customizable profiles, photos and ratings. For $12.55 a month, users can private message and participate in online chats with other users. The website sets itself apart from other sites with its question format, which ask users to share their favorite Disney songs, characters, parks and memories. Mouse Mingle joins the ever-growing list of niche dating sites like Whovian Love (for Doctor Who fans) and Date Vampires (Vampires). These sites are showing how consumers are very granular when they are searching for things online whether it be love or clothes, the days of general advertising are becoming a thing of the past. 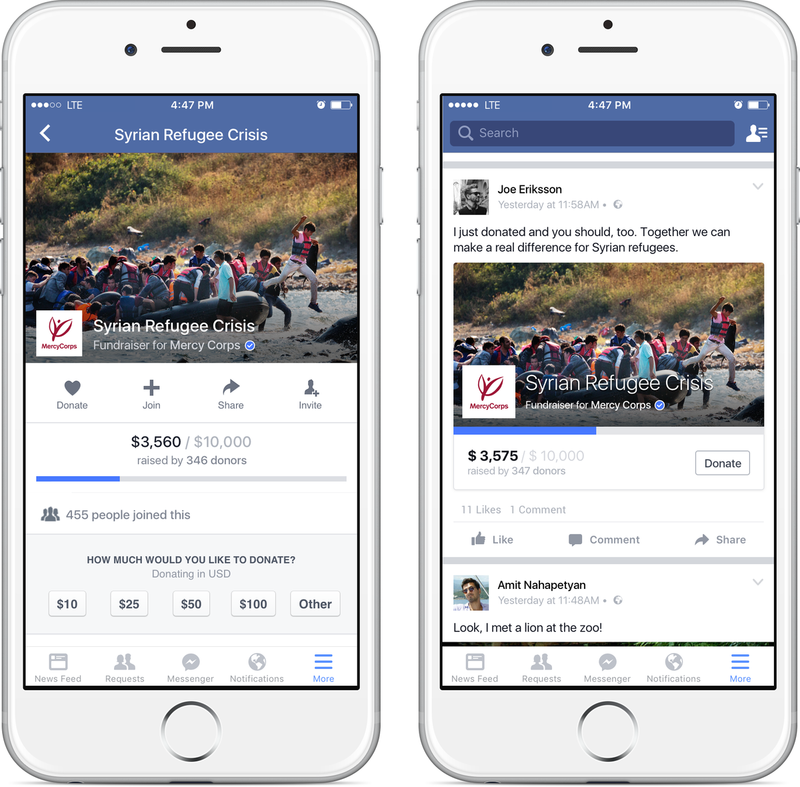 After recently announcing the creation of its Social Good team, which builds tools to help people do good around the world, Facebook has launched its latest cause-focused product called fundraiser pages which is an improved donate button for nonprofits. The fundraising dedicated pages provide nonprofits with the ability to raise money for specific campaigns. The Donate button, previously reserved for ads on the site, will now appear on nonprofits’ Pages and posts, allowing users to donate straight from their own News Feeds. The new fundraiser pages are similar to the format of event pages, allowing nonprofits to speak about their cause and collect donations directly from users. The new product will also showcase a progress bar towards reaching the specific goal the company has placed. Any fundraiser shared by a user in a post will display the new Donate button as well, allowing users to contribute through the post itself. Donate buttons on the nonprofits’ main Pages will remain static, right below their cover photos, providing a constant place to collect contributions even as they update their Pages’ content. It also allows users to choose whether to provide their emails — an important aspect for a nonprofit hoping to increase its donor base. The new fundraisers product and Donate button are now live for three nonprofit partners — Mercy Corps, the National Multiple Sclerosis Society and World Wildlife Fund. The features will extend to a total of 37 nonprofits across a range of causes throughout the holiday season, including (RED), charity: water, RAINN, UNICEF and Water.org. At the moment Facebook isn’t charging its partners for product use, but it will eventually implement a fee that covers operating costs at some point in 2016. The idea is for them to break even. Google and YouTube Let The Music Play! 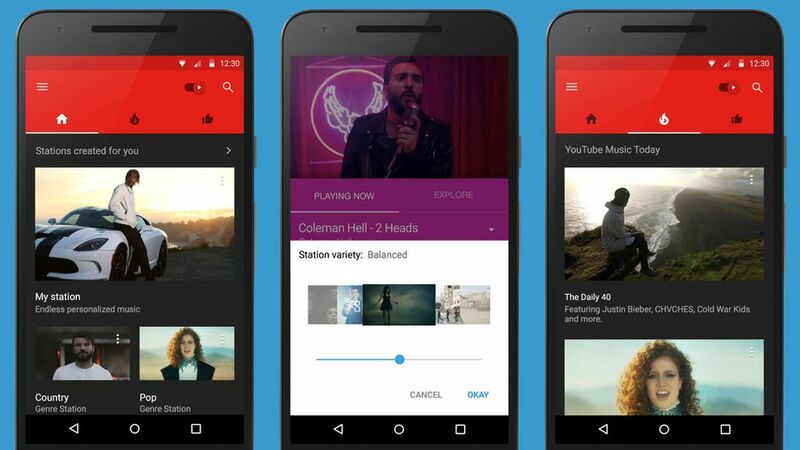 Google launched YouTube Music on Thursday, a standalone app that provides users with YouTube’s vast library of music. This is a free app but users who are signed up to YouTube red get special perks. YouTube Music is all about discovering new artists and new music. If you search for an artist, track or album, the app will provide official music videos, popular covers, remixes, and concert videos. Some features include, creating playlists, listening to personalized stations, and getting recommendations in the app’s home tab. YouTube Music is free but paying for a $9.99/month YouTube red subscription buys you quite a few extra features, like offline listening, the ability to switch between video and audio-only streams and the option to listen to tracks and videos in the background while in other apps. It also gets rid of the ads free users will hear when using the app. 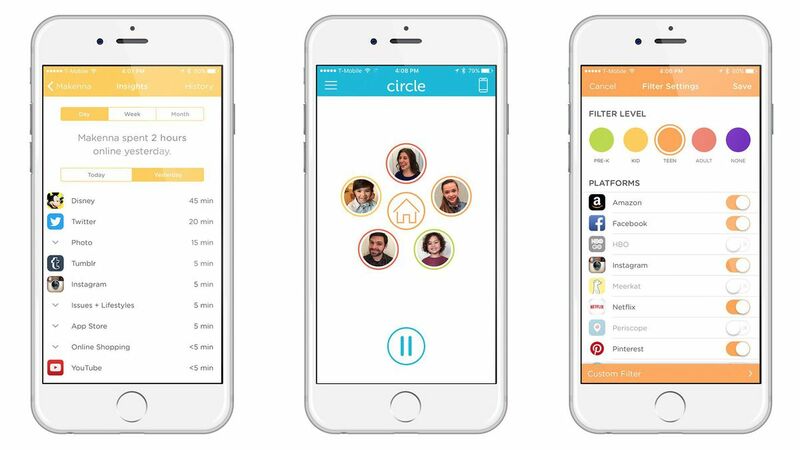 Circle was a failed kick-starter product that wanted to help parents monitor their children’s internet consumption. Almost two years later the product is up and running and even touting a partnership with Disney. 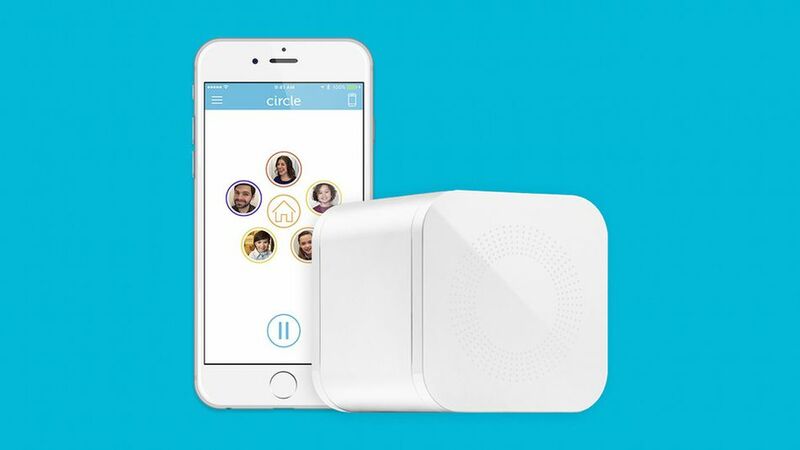 Circle with Disney hit stores this Wednesday for only $99. The small white cube-like product is an easy to use device that parents can access without dealing with a complicated router. it connects over wifi and gives parents free reign of the internet consumption of their children. Parents can set a time limits on sites and devices or for entire categories, such as games, social media or blogs. The app adds up the time your children spends on each of her devices and cuts them off when he or she has reached their limit. Time spent across platforms will add up to one total time for that website. You can set filter profiles by age so that it’s easy to customize by app and category. You can pause the Internet for specific devices, individual people or everyone in the house. There’s even a bedtime feature that lets you set sleep and awake times for devices, so “lights out” literallymeans lights out. the product also provides Insight into how many hours each person spends on a specific app, and the stats can be as granular as by day, week or month. The product also features categories of Disney licensed games, shows, and movies. Halloween is right around the corner…..literally. We’ve all had that moment where you show up dressed as Jesus and seven people at the party you are attending also decided to be the religious icon. Now with google Frightgeist, you can avoid that Halloween nightmare. Google’s new tool Frightgeist is a Google Trends powered map of the most popular costumes all over the U.S. The service takes data from top costume-related searches and shows both local and national trends. 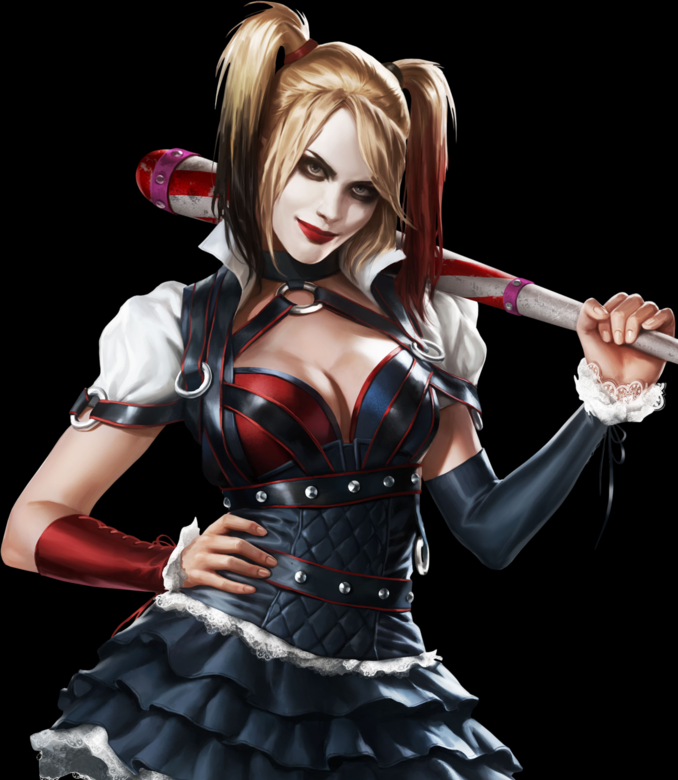 If you want to know what the most popular costume this halloween will be, drum roll………it is Harley Quinn the psychotic vixen, also known as the Joker’s girlfriend. And the most popular theme of costume this year in the U.S will be superheros.Get ready to see the whole justice league/avengers Halloween night. If you want to see if you made the right decision this Halloween check out the link below. On Monday, rapper Drake released the video for his hit song “Hotline Bling.” The the semi artistic video , showcases Drake slow grooving in a technicolor cube-like background, and was a huge hit via social media. Since the video went viral many social users have remixed the music, added graphics, and even words to poke fun at Drakes less than hip dance moves. Drake is no stranger to being an online hit, earlier in the year when he dropped his diss track “Back to Back” the internet went crazy with memes that highlight the lyrics. Prices for the jacket he wore in the video doubled!!! 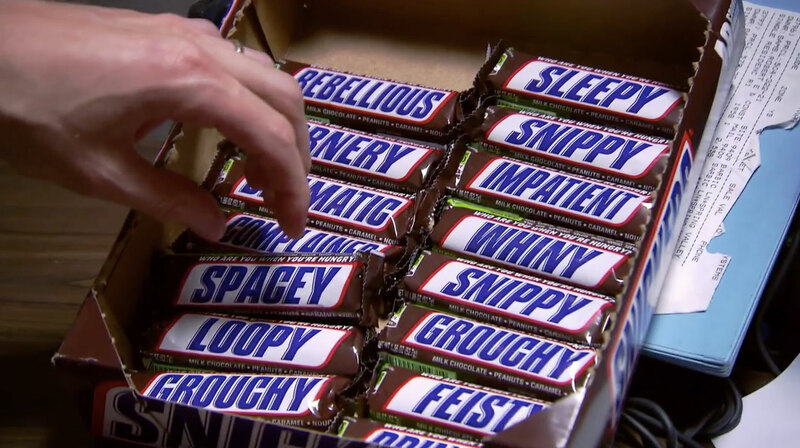 Snickers continues it popular social campaign “You’re Not You When You’re Hungry”, by targeting online gamers. The newest iteration of their unique campaign takes 3 popular online gamers with huge followings and captures the transformation that happens to your mind when your hungry. Each gamer was streaming on Twitch (a gaming platform) their usual broadcast and little by little began to making simple mistakes. As the stream progressed each person completely changed into a different character. These characters were based on the different feelings you get when you are hungry. One gamer represented getting spacey by becoming a hippie, another became an old lady for confusion, and the last one turned into a angry biker for cranky. 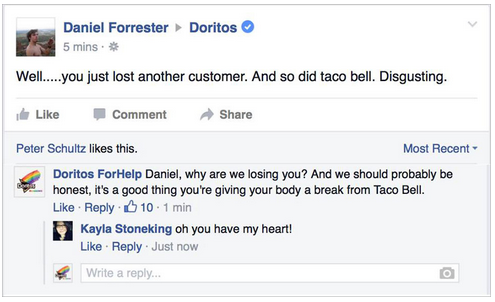 This social activation made great use of a new platform and showed a great understanding of target audience. This campaign blew up twitter and Reddit and really shows how unique marketing on social can be really successful . Doritos recently forged a partnership with the “It Gets Better Project”, which provides resources and outreach for young LBGT community members. 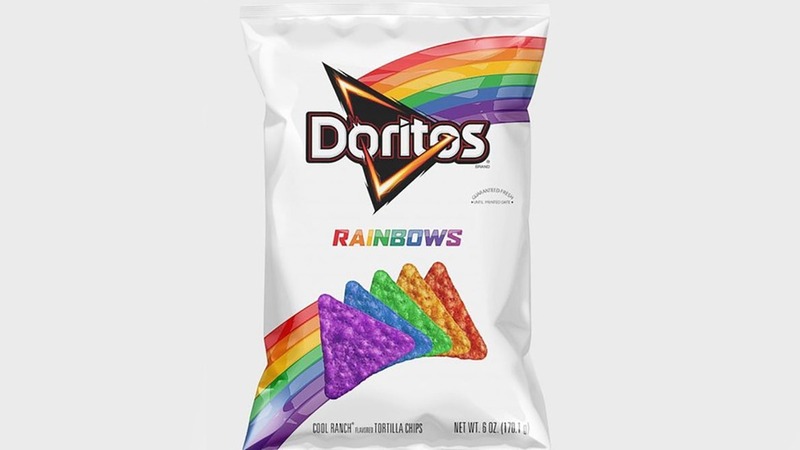 They created a limited edition batch of rainbow-colored chips. All the proceeds from the chips go towards the project. Needless to say their were a a lot of haters on social media for this, akin to Target and their gender neutral toy aisles. In similar fashion the same troll hero Mike Melgaard came to the rescue to shut down the haters and serve them up a heap of troll justice. 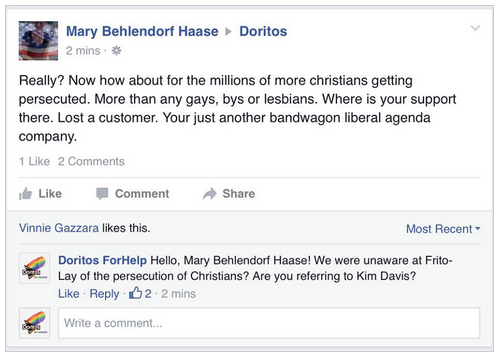 Mike Melgaard the man known for hacking the target Fb page took the handle DoritoHelps, and seamlessly shut down the haters. Barbie has had a lot of occupations in her life, she was an athlete, a fashion model, and even a hipster. But now she’s taking on her biggest role yet, an effective listener. 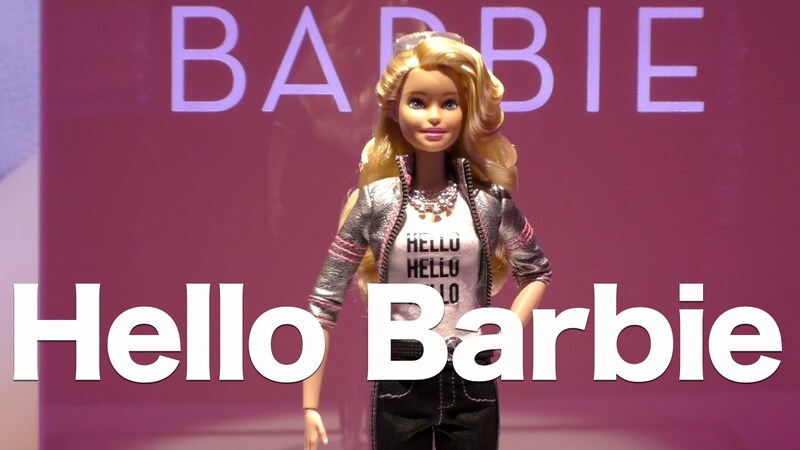 The latest Barbie iteration will allow her to talk with children through voice recognition and a cloud feature. The new hello Barbie will come with a pre- installed chip/speaker that will hold up to 10,000 phrases that parents can control through the accompanying app. Barbie will not only be able to speak with the child she will also be able to remember things she spoke to the child about and even ask follow up questions. With the cloud feature it is also possible to stay current with talking topics like what is the current top pop songs. Mattel said that these features will not delve into people’s personal lives it’s just a new way to form a deeper connection with Barbie. Pokemon is one of the most iconic games to hit the small screen, now these pocket monsters are breaking out and finding their way into the real world through augmented reality. This game is very similar to other Pokemon games where you can capture,battle, and trade over 700 different types of Pokemon. The difference with this game is that it will use your iPhone or android camera to show the monsters in real life. Whether it’s walking in the park, a busy city street, or even at the beach. This adds a new layer to game play that contains real world experience. This game is very similar to an April fools joke that google played using their map functionality. They issued a challenge to capture all the Pokemon in the real world using augmented reality as the selling point. The prize at the end was a job at Google. But most of the elements of the joke will find its way into the real app. 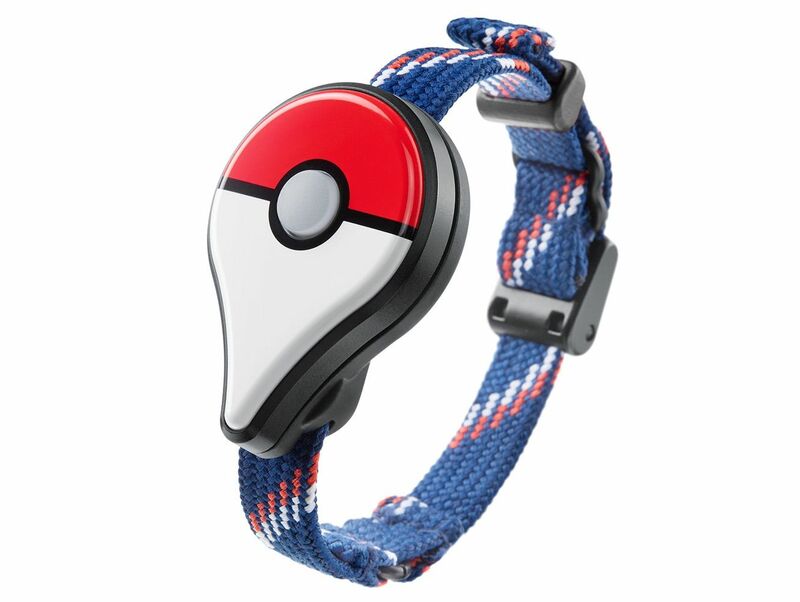 Another thing being released alongside the app is a wearable that will connect with the app. 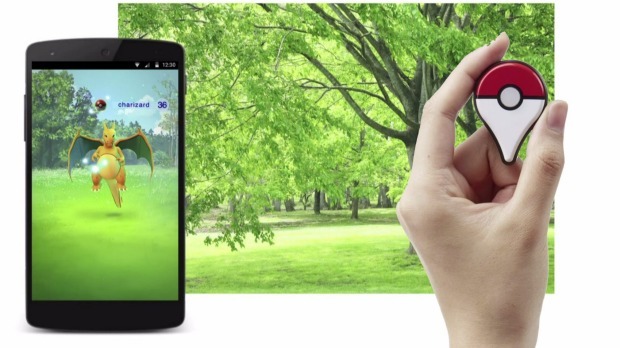 It will allow you to get updates when a new Pokemon is around. We are living in a world where swiping can find you love, pick a meal, and now even find you a job. 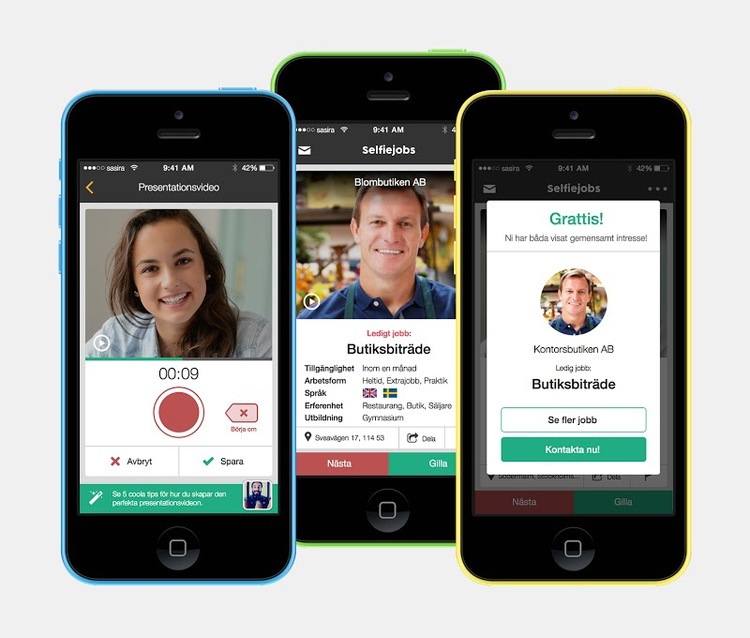 A Swedish developer just created a new app called “SelfieJobs” that turns your next job search into tinder like glory. The mechanics of this app are as such you download it, take a selfie, fill out a short profile, that includes your name, a description and a list of characteristics that would catch a recruiters eye, like education. You can also set how far you are willing to accept a job geographically—30 kilometers (18.6 miles) is the default setting. This app basically takes all of the career matching of linkedin and the fun of swiping and creates a new easy way to better search for jobs. Turns looking for a job fun! Bookings.com is taking UGC to the next level, by turning user submitted summer photos in to awesome GIFs. Between August 24th and September 3rd users can send their exciting summer pics to be giffafied. The contest stems from the company’s “Wing Everything” campaign, that pays homage to spontaneous vacations. Perspective participants can throw their hat in the ring by hash-tagging a pic with #WingItYeah on Twitter or Instagram, or by submitting the pic via the Booking.com Facebook page. Wieden + Kennedy Amsterdam has hired four digital artists to create the GIFS: James Kerr,Cari Vander Yacht, Chris Timmons and Justin Gammon. Google will soon add interactive watch faces to Android Wear, The future of wearables is about to meet the future of customization. 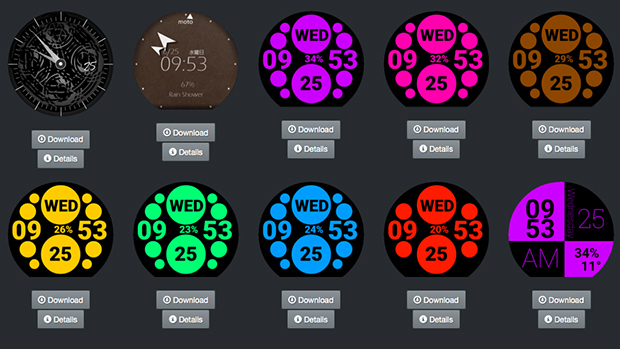 The new features of the watch faces give a new way to interact with information from a service without actually launching its app. A watch face may show a calendar and tapping on the widget could bring up your schedule for the day. The feature won’t be available until the next Android Wear update rolls out in the next few weeks but Google highlighted a few from the developers it worked with on the feature early on. The Bits face, allows you to choose the type of widgets that appear on the face with additional information shown when you tap into a particular item like weather or your calendar. Their will be 21 widgets rolling out with next round of android updates including and Under Amrour one that relays fitness info without launching the app, and an app called together that lets you converse with other app users though doodles, emojis, and text. McDonald’s France just created an ad that is equally crazy and fun. It boggles the mind by displaying a world where we are all just emojis. The brand showcases almost every emoji in everyday situations. 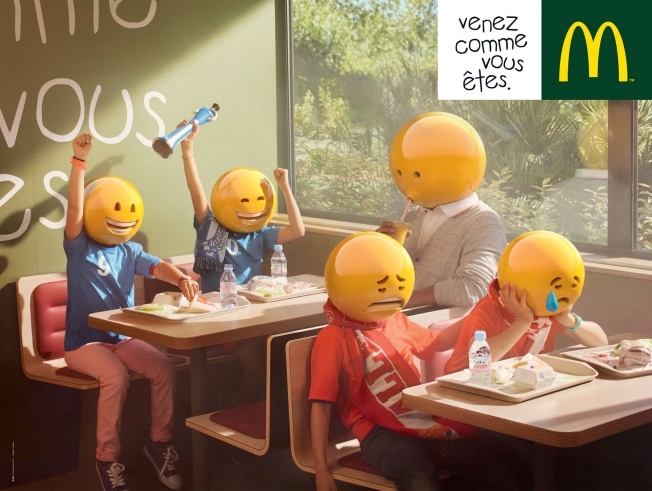 It may seem like McDonald’s was just trying to capitalize on the emoji craze but understanding McDonald’s tone, I feel it’s a match made in heaven. The ad also has a funky rendition of The Buggles “Video Killed the Radio Star” which can also be taken in context as new tech is creating new ways to communicate hence leaving older forms “dead”. Some may say the ad can be a little creepy considering it’s taken the personal aspect out of the equation. I think it’s just a way to showcase that we all are communicating in a completely new way that we wouldn’t have years ago. This new form of communication does have a unifying aspect to it. Tinder has been adding to its hook up list for awhile now but their latest one is the most prestigious one yet, Forbes. Yes, Forbes magazine and tinder have officially partnered up and will be serving your favorite swipe technique in a joint effort. However this version is not just for anyone. 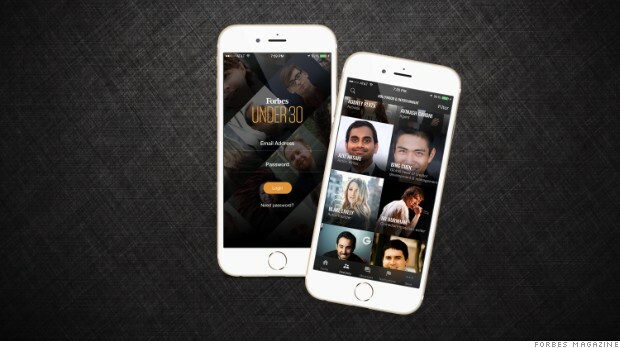 This special version of the app will only be available for the Forbes list of 30 under 30 who are the movers and shakers in all facets of the business,entertainment, and tech world. Some notable examples are snapchats Evan spiegel and “Harry Potters” Emma Watson. Tinder is finding so many ways to stay relevant and I’m interested to see who they wil partner with next!